I am SO tired lately. Part of it is my moods, part is I haven’t been able to run and the other part is..who knows. I was in bed by 10pm last night, up at 6:15am this morning and didn’t feel like I slept at all. I even left work early today and took a nap this afternoon. I woke up feeling a bit better, but not much. Jacey lost another tooth, this makes number 4 since January. She is thrilled and thinks she looks “soooo cute”! I spent this weekend working on year end teacher’s gifts. I always decide to make something, get halfway through and regret being so crafty…LOL! I got finished though and hope they like them. 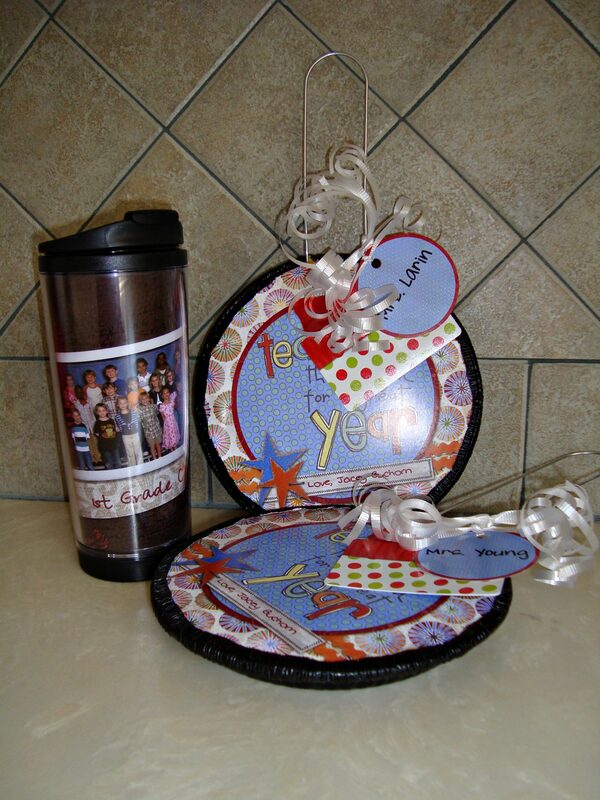 I ended up making movie packs (popcorn and Blockbuster gift cards) for her main teacher and GT science teacher as well as a travel mug for her main teacher. We had absolutely gorgeous weather all weekend, so we hit the pool Friday and the beach Saturday. 2 hours at both, no sunscreen at the pool and no sunburn…sunscreen at the beach and I came back with lobster legs. Go figure…LOL! This made me smile today and now I can’t get it out of my head. The creativity and time that went into it is mind boggling. I got a blog award from Mary. Here are the details. 1.As a dedication for those who love blogging and love to encourage friendships through blogging. 2.To seek the reasons why we all love blogging. 3.Put the award in one post as soon as you receive it. 4.Don’t forget to mention the person who gives you the award. 5.Answer the award’s question by writing the reason why you love blogging. 6.Tag and distribute the award to as many people as you like. Why I love blogging..huh?! I love to blog, because it is an out for me. A way to express what I am thinking and feeling no matter how exciting or mundane it may be that day. A place where I can have my opinions and not get blasted for them (those comments go in the trash :). It is also a nice avenue to share pics and happenings with friends and family arounf the world. Plus, when I started it years ago…it was just cool in the geeky sense and well, my license plate does say GRLGEEK after all. I am going the be the spoil sport and not tag anyone though. If you are one of my friends and read this, consider it your tag! 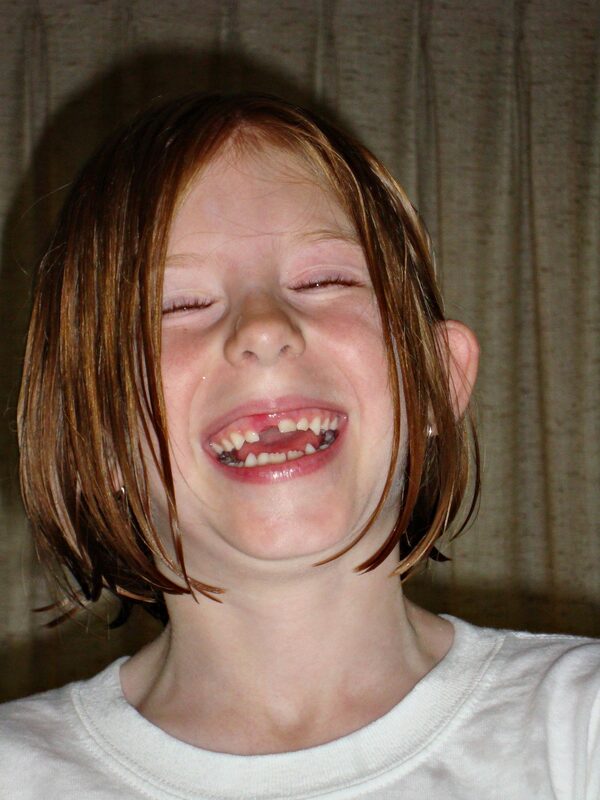 Does she talk funny now that she lost a top tooth? Ian lost both of his last weekend and talks with a lisp now and it is so cute!! I find myself asking him to say stuff with s’s in it just to hear him. Have a good rest of the week!! I am super tired too, Darren’s gone again and I just never sleep right when he is gone.